This story took my breath away. I am not the kind of person that cries, especially while reading a book but this one really got me. It was so touching and beautifully written I highly recommend it. We get a peek into the life of Fig and what she considered normal life. As an only child that lives on a farm she is inseparable from her mother. But when Fig turns six her mother has a psychotic break down and the family has to close ranks to try to make a liveable home. Fig's grandmother takes on a bigger role in caring for her, but Fig has never been close to her grandmother. Fig's father is struggling to maintain the farm and trying to support Fig and her mother who they put in a hospital for awhile. He finds comfort in the routine and hard work of working on the farm. Fig tells us her story from six years old to nineteen, an age she is dreading because that was when her mother had her first psychotic episode. 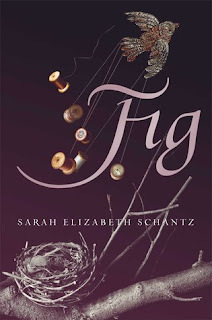 There is a very melancholy feel to the story as Fig has a very hard time not only adjusting to the new family structure but also making friends and begins to take her mental frustrations out in different ways into the physical world. I am ready to vote this as my favorite book of the year. The prose was so beautiful and emotionally on point to bring the reader right into Fig's world. It really touches on some hard situations and insight into families dealing with mental illness and hard relationships.